The son of immigrants, Perez benefited from the example set by his parents. He witnessed how their hard work, dedication and commitment to serving others enabled them to overcome daunting challenges and achieve remarkable success in their new country. 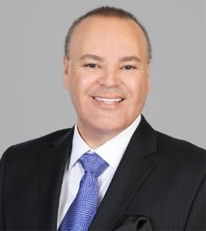 Today Perez is Chairman of The BaronHR Family of Staffing Companies, one of the nation’s fastest growing staffing agencies, with branch offices throughout the United States and relationships with some of the nation’s most successful and prestigious corporations. In 2002, Perez became the youngest individual to receive the prestigious Ernst and Young Entrepreneur of the Year Award presented by USA Today, Nasdaq, and CNN– an honor previously bestowed on such well-known business leaders as Michael Dell of Dell Computer, Richard M. Schulze of Best Buy, and Jack and Andy Taylor of Enterprise Rent-A-Car. His accomplishments have been recognized by publications ranging from the Orange County Business Journal to Hispanic Magazine, and the Los Angeles Business Journal has listed his company as one of southern California’s most successful privately owned businesses. Perez has also been honored for his work as a community leader, receiving the Oscar De La Hoya Foundation Champion Award and the California Gold Star Leadership Award. Perez is committed to helping minority-group members and is particularly passionate about assisting those in the Hispanic community. Perez is also driven by a moral imperative to contribute generously to the community, help his fellow humans-in-need, and live by a high set of ethical values. His passion for helping people is demonstrated by the creation of the Lou E. Perez Foundation, a philanthropy committed to assisting children with life-threatening illnesses and their families through financial support and other assistance. The foundation, which has established partnerships with more than 100 organizations throughout the country, has touched the lives of more than 300 families, helping make life a bit easier for those in need. Like many Americans, Lou E. Perez is a passionate baseball fan. Unlike most Americans, his dream of owning a baseball franchise almost came true when, in 2003, he joined with a group of investors to purchase the Anaheim Angels Baseball Club from The Walt Disney Company. Though Arte Moreno eventually outbid his group, Perez became friends with the new team owner, and they continue to share a great love for baseball, business, and helping improve quality of life in the local community. Perez resides in Orange County, California with his wife, Lauren, and his three sons.